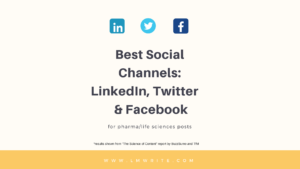 Life sciences, medical diagnostics and pharma-related companies – especially those under the FDA’s umbrella – are reluctant practitioners of content marketing and the use of social media platforms. As someone who has worked with B2B businesses for years, it’s a reality I long ago came to terms with: for maximum engagement, B2C type content outshines B2B content…by a huge margin. One of the challenges B2B content marketers face is that few industries are the same in terms of how content will perform on social media. 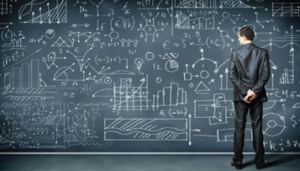 What works for a marketing company isn’t effective for pharmaceutical companies. What audiences find engaging for a travel site is very different from say, a Dutch engineering firm’s content. She goes on to suggest what I’ve also found to be true: regulated drug companies tend to stick to a single product or – more likely – a disease state, such as breast cancer or Alzheimer’s. It’s a sensible solution, since it reduces the risk of running into problems with regulators. But many life sciences-related companies do understand the value of content marketing – and how social media can increase awareness of their brand as well as start conversations with their potential customers. So how does the pharma industry stack up against other segments, in social media world? Recently I attended the Technology for Marketing (TfM) conference, and I’m finally working through materials and notes from various sessions. One session in particular I found extremely interesting – The Science of Content – especially since it speaks to something that is always top-of-mind to me as a content writer. TfM looked at 15,000 posts from each industry segment and it was interesting to see the differences in average shares per post. 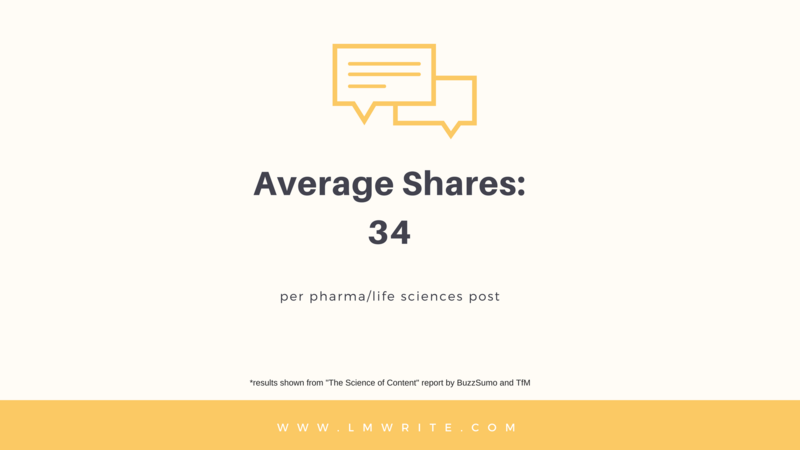 News items, for instance, received an average of 17,747 shares, while pharma posts saw just 34 shares on average. Understanding the response level benchmarks for your industry helps provide a realistic expectation of your social program’s performance. The Buzzsumo/TFM research confirmed Facebook’s dominance – especially in the news and consumer markets where Facebook makes up 90+% of all shares. And – no surprise for B2B marketers – they found that in B2B segments such as pharma, Facebook still played a role (34%) – but it was much more balanced by LinkedIn at 43% and Twitter (22%). Pinterest, as expected, played a role in Fashion, and Google+ … well, here’s their finding: “It has little relevance as a content distribution [channel] in any market.” Ouch. It turns out that content length varies by industry. 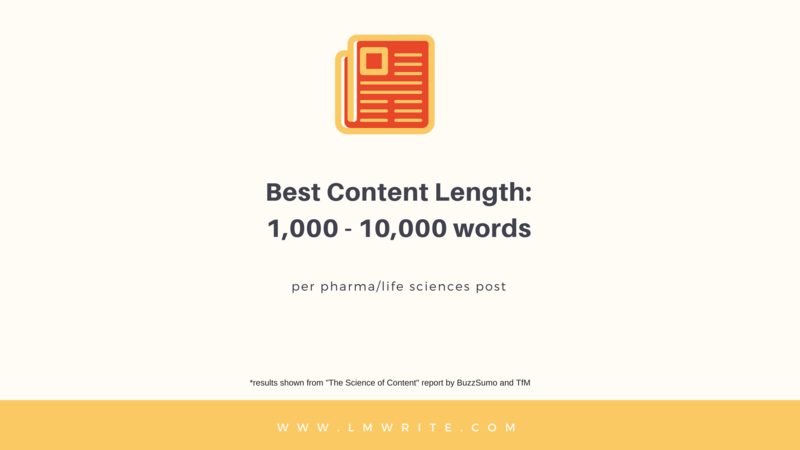 The automotive industry, for example, prefers shorter content (0-1,000 words), while the I.T., financial, pharma and travel industries tend to consume more long-form material (1,000-10,000 words). 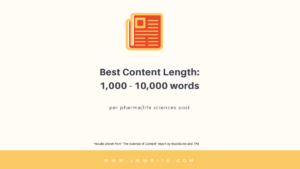 Pharma’s two most successful content lengths were 1,000 – 2,000 words and between 3,000 – 10,000 words – the segments coming in at 29% and 30% respectively. Word count for marketing was similarly high – we have a lot to say. The general rule for most industries? Longer, in-depth content tends to get more shares and links – especially in B2B. This is one of the most frequent questions I am asked – “What should we write about or share and should we use video?” The TfM report laid out the types of content you should be creating. It told us exactly what works for getting shares. Content studied was defined as: Infographic, List, How-to article, Why Posts, What Posts, Video or All Content. Among the key findings: video works particularly well in news media, but underperforms in pharma and IT. 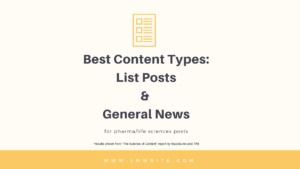 How-to articles were by far the most-shared financial content, while lists were popular in the pharma sector. 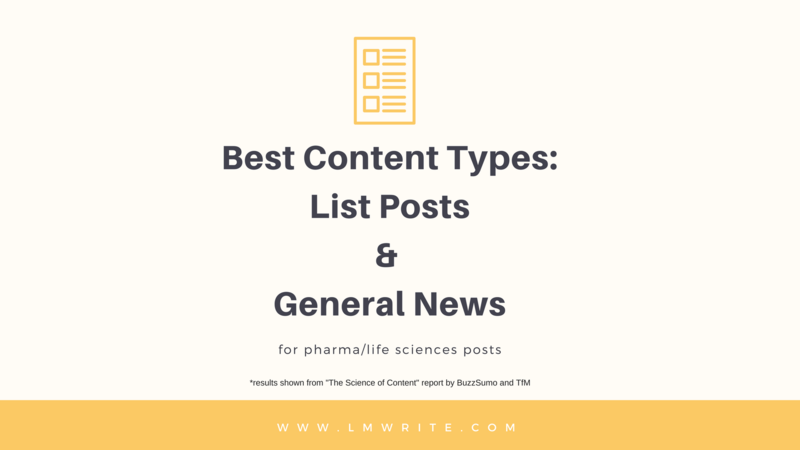 Overall, list posts and general news-style headlines performed best for pharma. There weren’t too many surprises about when to publish content during the week. In the B2B industries, content didn’t perform well generally on weekends. 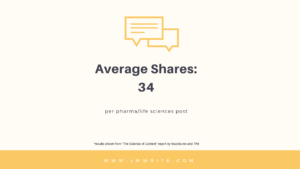 For pharma, posts published on Wednesday and Thursday received the most shares. Overall, the report was valuable in highlighting the vast differences that exist engagement-wise between B2C and B2B segments. It also reinforces something I find myself frequently explaining to life science and pharma B2B clients: they will not experience Kardashian-level engagement, and that’s not a bad thing. 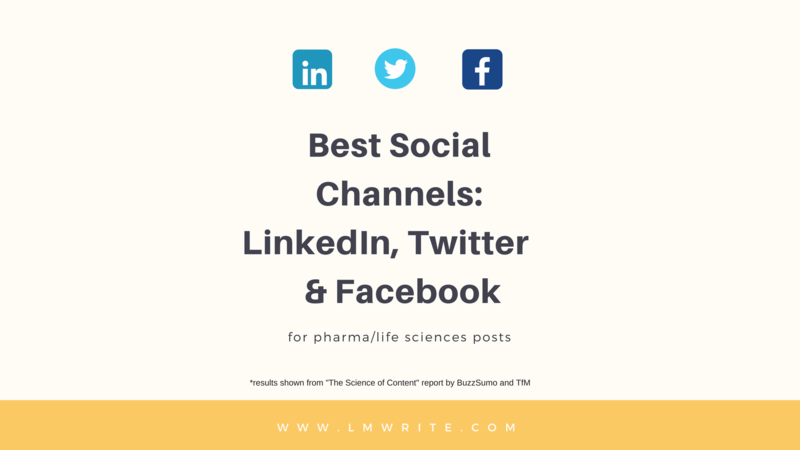 When 50 people in the life sciences industry (people who are actually invested in the client’s pharma-related subject matter) share or engage with their content, it’s going to be more valuable – and impactful on the Company’s bottom line – than thousands of likes or shares by the general public. That’s the key takeaway of B2B social: accurately identifying, finding and targeting your audience, and tailoring the message to your audience. Three Common B2B Website Mistakes: Is Your Website at Risk?